Data Encryption is a security practice, which is known to many but most users avoid it in their daily lives due to a variety of reasons. Some just procrastinate, some do not want to go deep into the hassles of the process, others do not have the required expertise and tools and rest of them do not know exactly how to go forward to encrypt the files, folders and disks to protect your data falling into wrong hands. There are a lot of data encryption tools and utilities available on Internet for download. You can even find some of them reviewed on this blog also. Today we are looking at a freeware, open source encryption tool, which allows you to encrypt your files and folders on-the-fly. FreeOTFE derives its name from its function. Yes, you guessed it right, OTFE stands for On-The-Fly-Encryption. It has the capability of encrypting your files and folders on the fly as you work on them just like a normal file. And if you are thinking that it might affect the speed of your task, then be assured that it will have a minimal effect, which will not even be noticeable to an average user. The easiest way to use FreeOTFE is to create a few encrypted files, which can be used on your disk like any other file. And if you want to make them invisible, just use the software to dismount these files and folders. They will no longer be visible in the Windows Explorer and you will require the password to see them. Or, if you want, you can create an entire partition or volume on your drive encrypted with this nifty data encryption tool. 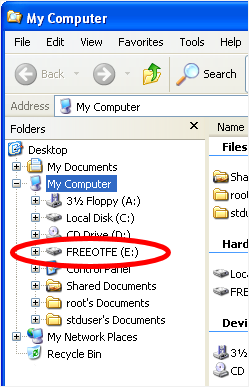 FreeOTFE is a great way to encrypt data on your USB sticks and portable drives. Just make that data encrypted and you can carry your portable disk safely. If you happen to lose them, the data stored on these disks simply becomes inaccessible. The website has a detailed literature on how-to-use and different limitations and capabilities of this tool. Check out this useful open source data encryption tool.